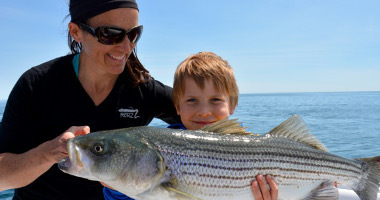 4/2/19: Regulation Update The black sea bass fishing season opens Saturday, May 18th. Time to book your 2019 Cape Cod fishing charter to get the best dates – remember June for striped bass and September for bluefin tuna fill in fast! We greatly look forward to fishing with you, contact us now. Reel Deal Fishing Charters has three fully equipped vessels that carry up to six passengers. Ready for an amazing day on Cape Cod waters with the Reel Deal? For an unforgettable sports fishing venture, book with Reel Deal Fishing Charters. Our fishing charter in Truro, Massachusetts, takes you onto the waters of Cape Cod with an experienced captain to serve as your fishing guide. Experience deep sea fishing at its finest. For information on fishing, be sure to read Captain Bobby Rice's column in On The Water magazine this season. Come and have the time of your life on Cape Cod's beautiful waters where excellent fishing is only moments away. When you fish aboard the Reel Deal with Captain Bobby Rice, you receive the true fishing experience as you land stripers, blues, and tuna that are bound to take you for an unforgettable ride. With 15 years in the charter business, plus more than 20 years of commercial fishing, we are one of the first charter businesses in Truro, and continue to be described as the best. Conveniently located between Wellfleet and Provincetown, we also offer trips out of the Orleans area for those on the upper Cape or off Cape--we are worth the drive. You have found the captain you want to hire. We welcome anglers of all ages and skill levels--from those curious to try out fishing for the first time to the seasoned salty dog who is looking for a few more great moments on the water. We customize your fishing trip, whether you are looking for a fun family trip with the kids or a hearty day on the water where you control the gear, just let us know. 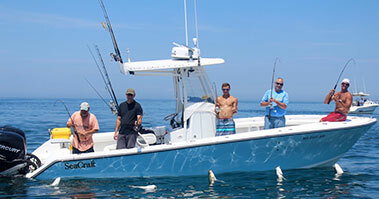 Reel Deal Fishing Charters is a must for your Cape Cod vacation in Massachusetts. Top off a great day of fishing with an excellent meal at the Whitman House Restaurant & Bass Tavern. You may even be able to convince the chef to cook up your catch. 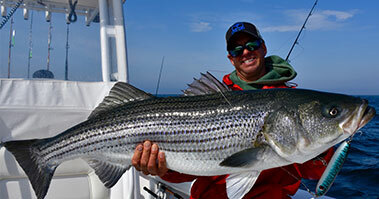 Contact us today for information on your upcoming Cape Cod fishing adventure. We proudly serve customers in Truro, Massachusetts, and surrounding communities throughout Cape Cod and New England.